Vermont is one of a handful of states in which writing and performing bad music is a crime. It's true. You can look it up. It's in the Vermont Statutes Annotated Title 10, § 35,360(b), revised April 1979, Crimes against Decency and Rectitude, Civil, "... and let not the harsh confabulation of composed and performed sounds be loosed upon the gentle earbones of the populace of Vermont from this day forth, a Tuesday, without due nasty recompense from those who sit in judgment thereof, having been duly appointed by the members of the selectboard for a term not to exceed the life expectancy of the appointee him or herself. The position, called tune arbiter, shall be funded not, but rather pleasure in the act of laying to rest the charlatanical musical dilettante who aspires to mediocrity shall be just compensation enough." The law goes on to itemize punishment which, depending on the severity of the infraction, ranges from simple flogging to hundreds of hours of community service to incarceration of up to 60 days, which is reserved for music of extremely poor craftsmanship. Although the law has been on the books for nearly 19 years, it is unfortunately rarely enforced these days. This was not always so. During the bad music heydays of the early 1980s, tune arbiters regularly rounded up incompetent musicians after they played as few as eight bars. To many ears, the results were glorious. Gone were the hackneyed Showboat-like themes and unlistenable serial complexities that plagued neighboring New York and New Hampshire. In their place arose music which reflected the mapley passion and genuine affection for livestock which spelled Vermont. The statewide music scene had begun to turn a corner. Second class Banjo Dan wanna-bes split for less demanding climes. But then, naturally, the American Civil Liberties Union got into the act. Calling the law biased against and unfair to the musically inept, the ACLU began to vigorously defend the accused parties, citing vague US Constitution privileges. A deviously clever interpretation of the Fifth Amendment led to a passel of conviction reversals, and soon the musical environment recommenced its downward spiral towards the lowest common denominator, a form of musical expression so banal it has never been reached. To compensate for this misguided libertarianism, musical vigilantes have begun to spring up around the state. At first limiting their enthusiasm to torching out of tune pianos and hanging in effigy the likes of Andrew Lloyd Webber, their recent exploits sometimes coerced what we would call legitimate performers to curtail their artistic endeavors. The Vermont Symphony Orchestra was prevented from performing Beethoven's First Piano Concerto with a freshly exhumed -- though still quite defunct -- Rudolph Serkin propped up in front of the keyboard, his part being otherwise satisfactorily rendered via MIDI. The Onion River Chorus was dissuaded from tackling Earwigs, a new tune by a member of this very staff, simply because the word "disgust" fell predictably on an upward leap of a tritone, and instead chose to learn Le Flambeau Oriange, a simpering wiener of a tune by a composer so incompetent that the bar lines run parallel to the staves. Not that I'm being judgmental; that's for the tune arbiters. But they've been keeping low profiles lately. What with the purging of shape note sings, the ethnic cleansing of contemporary music ensembles, the dissolution of battles of the bands, the slaughter of tenth avenue street musicians by self-aggrandizing clandestine factions other than themselves, it's no wonder they're leery. Perhaps it's time to repeal V.S.A. 10, § 35,360(b), the Musical Decency Act, and let mediocrity occur unimpeded where it may. 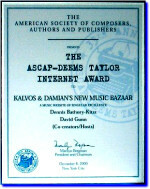 More likely, it's time for the 149th -- yes, that's the penultimate sesqui -- episode of Kalvos & Damian's New Music Bazaar, as good as place as any to take a music stand. And here with a history of one-night stands, at least as they pertain to platform posture, is Kalvos.